Mid-way through the first quarter, and you’re settling into your routine. Right about now is when everyone begins taking a closer look at the realities of how they’re going to achieve the forecast for the year. Pipelines, deadlines, timelines all become the main point of focus. And last year’s patterns begin to reappear. The workflows, the messages, the product plans, the customer issues. It begins to feel like more of the same—a continuation of last year. For some, this is good news. Because last year might have marked a milestone in your company’s growth. However, for many, this begins to feel like a concern. Is another 2017 going to help you achieve your goals for 2018? Do you have all the pieces in place to grow and evolve as planned? Asking key questions about your preparedness for 2018 can shed light on areas in need of focus—or change. Here are 7 questions that make great conversation starters with your team to turn 2018 into the year you hope it will be. 1. Do we all agree on what we’re selling and the value it delivers to our customers? It seems obvious, but most of the time this question is asked, it yields different answers from different parts of the company. Sales thinks differently than Development, Marketing differently from Customer Service. It’s important that these perceptions be shared and explored so everyone understands and gravitates toward being on the same page. Once this is achieved, it steers everyone’s day-to-day interaction with prospects and customers toward the same line of thinking—an important ingredient to deliver consistency to the market and your customers. 2. Do we have a clear picture of the pipeline and what it will take to convert those prospects to new customers? Simply generating an accurate sales pipeline can be a challenge, especially for a new company that’s still finding its legs. You should be able to construct a view of pending, short-term and longer-term opportunities with an understanding of potential value and what it will take to move them through the pipeline. Do prospects need more consensus, more information, more solution/pain alignment? This is a regular discussion and a great one to have to drive constructive business development discussion as a team. 3. Is our forecast realistic? If you don’t have a clear picture of your sales pipeline from the previous step, I’d suggest that the forecast is probably not as accurate as it could be. Do you have at least 1-2 years of sales upon which to seed 2018’s projected growth? And, from there, everyone constructs the upward-trending growth line. What’s your growth percentage based upon for 2018? Perhaps start this discussion simply by focusing on Q1—does your team believe the goal numbers to be achievable? 4. Does our business development team have what they need to succeed? Sales enablement materials, technical support, product knowledge, opportunities, competitive intelligence—the list is long. Any of your customer-facing team members should be armed with the most complete, up-to-date information needed for them to engage prospects and customers with confidence, driving the conversation instead of scrambling for answers. Build your list of needs and start chipping away at it as soon as you possibly can. Everyone will benefit. 5. 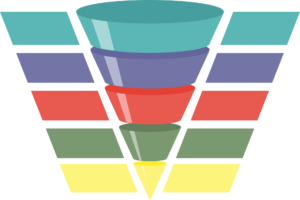 Are we connecting to enough new prospects to fill the top of the sales funnel? Marketing has a difficult job, period. We work with companies in many different verticals with many different business models. But the common theme we see is that marketing is as challenging today as it has ever been. While it’s true, it’s easier than ever to reach people, it’s also much harder to stand out from the noise and engage an always-busy, multitasking, information-assaulted target market. Marketing’s goal is to fill the pipeline with opportunities—but critically, the right opportunities, not just anyone. This is achieved by continually learning and updating the profile of ideal prospects—and using that information to make highly-specific messaging that speaks directly to the individual prospect. If the answer to the above question is ”no”, the cause is often related to how well the message matches the individual meant to consume it. 6. What does our target market think of us? And do they even know who we are!? OK, two questions here, but they’re related of course. Feedback from the market comes from many sources—online reviews, commentary, emails—and most importantly, all customer-facing team members. This is gold in my opinion. What are people saying in response to your message, your product/service, your value proposition? Is it believable, valued, in alignment with their needs? If not, why not, and what tuning does it need? Try some alternative message verbiage until you get it right. Also, the related question—do they know who you are? Do they remember seeing any recent marketing from your company? Ads, emails, social media posts, conference appearances—anything? While true, the importance of brand awareness can vary wildly by business model (it might not be the most important thing to get in place right now), it is useful to know whether you’re beginning to show up on their radar. 7. What’s the most important missing ingredient in our company right now? A favorite question to ask—but one that is accompanied by a word of caution. Before asking this question, make sure you set the tone properly. This is not a call for a shopping list of new product feature/functionality, neither a promise to get everyone new Aeron chairs, nor is it a commitment to implement everyone’s ideas—good though they might be. It is instead an opportunity to step back as a group and look at the company as a “machine” for connecting to the market and delivering product or services. How well tuned is that machine? What pieces are missing? New prospects, new sales material, new marketing opportunities? Where is “oil” needed to smooth the operation? And how can you turn up the speed of the machine? Honestly, I could go beyond 7 questions—well into the teens, twenties, and thirties easily—with critical questions like this. But the above list is a good starting point to get your team talking about what’s working and what’s needed to succeed this year. Share this article with your team. Hold a meeting—this week if possible—to discuss these questions. Ask your team to contribute openly. Explain that this is a “safe” discussion, that all ideas are on the table. Engage in a collaborative, cooperative, constructive dialog to identify areas within your company that—if tuned—could benefit all by delivering new, happy customers. Good luck with your discussions—and here’s wishing you a prosperous 2018! And if you want more information or insight about this activity, drop us a line. We routinely guide companies through conversations like this to clarify their current business development approach, identify issues and develop a roadmap for improving in these critical areas.